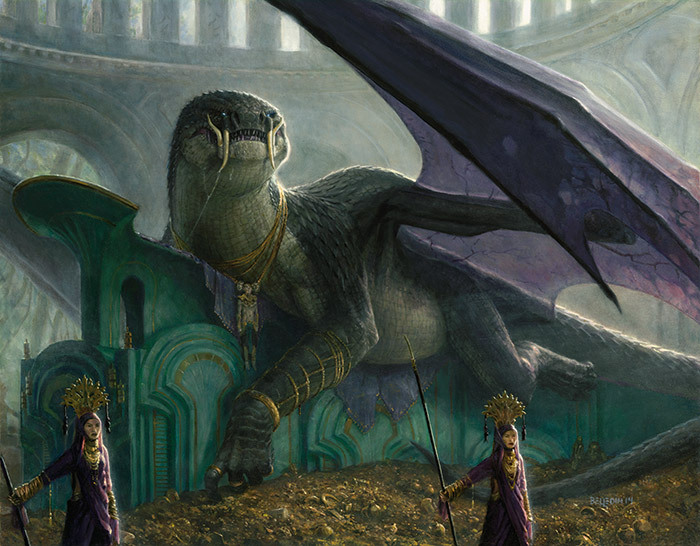 The Den Protectors were an opportunistic play after my early identification of the card as a major force in the early rounds of Standard at Pro Tour Dragons of Tarkir yesterday. The card spiked hard towards $5 from $1.50 and I’ve already managed to flip most of the copies through Pucatrade. The rest of my purchases were just cards on my acquisition list that I snag whenever the opportunity arises. Most of the rest of my activity was just a few minor value trades, as I am ramping up funds to jump in on some boxes of MM2. 4x Dragonlord Silumgar on MTGO for 4.39 tix per. 7x Atarka’s Command. 3x for 2.59 tickets per, 4x for 2.69 per. 1x Dragonlord Silumgar for $4.64 from player. 36 packs of Khans of Tarkir (MTGO) at 1.3 tix each. 2 Dack Fayden at 2496 points each. Foil Dack Fayden currently has a 10 times multiplier, which is probably appropriate for a powerhouse Vintage and Cube card. That said, Conspiracywasn’t widely opened, and unless Dack is reprinted somewhere, I can’t see this price doing anything but going up. It briefly flirted with a negative spread last week, but now it’s down to a more normal 28 percent. At the very least, I don’t see myself losing money here, especially since I used PucaPoints, and I don’t think it will be that hard to convert these points into cash on a 1:1 basis (meaning I believe that eventually a buylist will pay $25 for this). As I focused on in my introductory article, you’ll notice that I am using the non-cash resources at my disposal to pick up cards. If you leverage your collection in the right way, you can be active in MTG finance while rarely spending actual money. I didn’t spend a dime on the game this week, but I expect to be able to profit of Magic anyway. any thoughts on deathmist raptor on MTGO? Lol….just noticed that all of the Dragonlord Silumgars on StarCity sold out, as well as all of the lower buy it nows on eBay. Somebody made a run on both foils and non on TCG as well. Price is rising. Watched some coverage this weekend and saw a few copies of Dragonlord’s Prerogative make top 8. After seeing the decklists, I counted 3 copies in the top 8. Does this look like a card that can go from under 50 cents to a couple dollars to anyone? Also, I picked up MORE then a playset, and some foils. I believe UB will be a force for a while with the playable dragons giving blue a UU counterspell. That said, I’m glad I bought into UB, because Icefell Regents (only got 2 playsets) just spiked.